This sale is for One Brown Colored Anodized Aluminum 6 inch Curved Hair Fork. Each has a Rhinestone added to them to add a little sparkle. They are 6 inches long and a little over 1 inch wide and just under 10mm or 3/16 of an inch thick.This Hair Fork is curved to fit the contour of your head. The Functional Prong Length (FPL) is about 5" for this Aluminum 2-Prong Hair Fork and varies within 1/4" from piece to piece. The space between the two prongs is about 1/2". 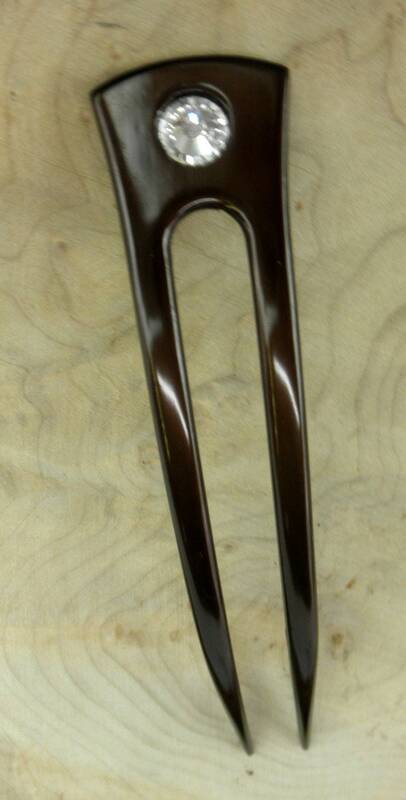 You get ONE Brown Colored Anodized Aluminum Six Inch Curved Hair Fork in this sale ! I bought four forks for my daughter-in-laws and nieces. They all have long, thick hair and claim they can't live without them. There seems to be allot of borrowing and trading going on! (this is my second purchase of sticks & forks). Thank you for placing them on sale and for the very fast delivery! Truely unbreakable! And elegant. Perfect service, friendly communication. It's a pleasure to buy here. Thanks alot.